With the video it was easier folding and cutting the shapes than I’d imagined. But it was rather hot and humid in my Barcelona kitchen so the uncooked shapes looked a bit limp and misshapen. So I wasn’t inspired to take photos (sorry) until magically they came out of the oven looking not too bad! Here they are before sprinkling with icing sugar. 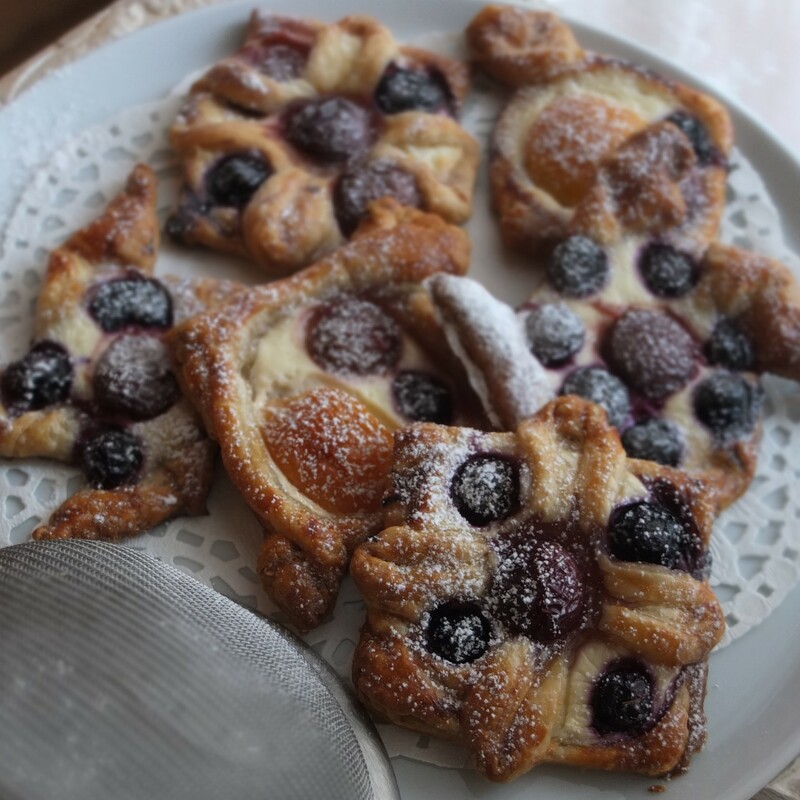 I have yet to try the lattice but my favourite shape’s the flower and they’re all lovely – the pinwheels have lovely crisp triangle ‘legs’ sticking out. 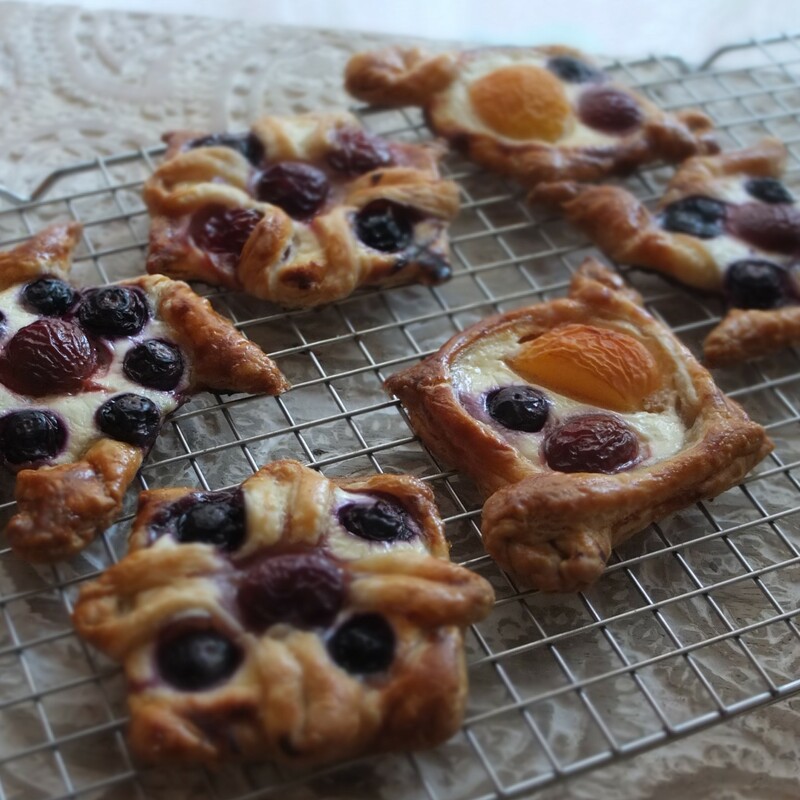 Mine have apricot pieces, cherries in the middle and blueberries round the outside or just a combination. 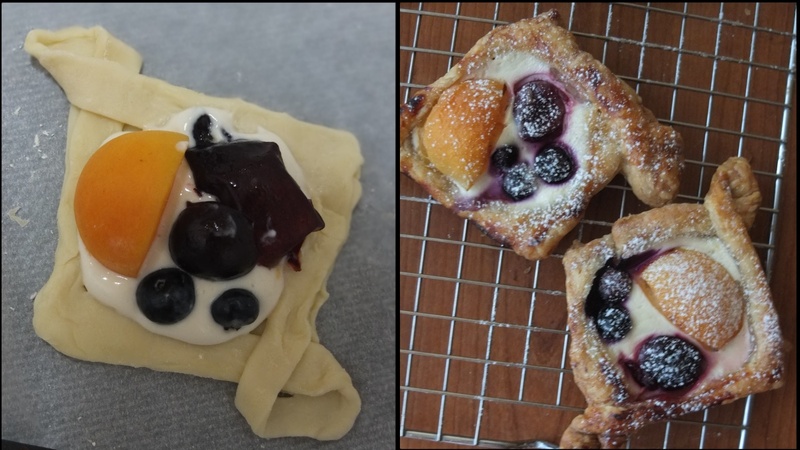 I recommend the three fruit together on one pastry. Or add your own choice of seasonal fruit! 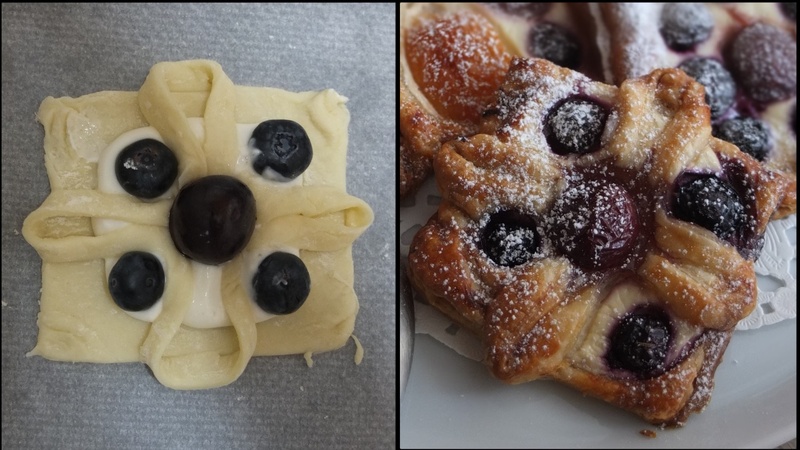 200g/7oz puff pastry – shop-bought all-butter puff pastry or my homemade inverted puff pastry (recipe here) if it’s cool enough in your kitchen! 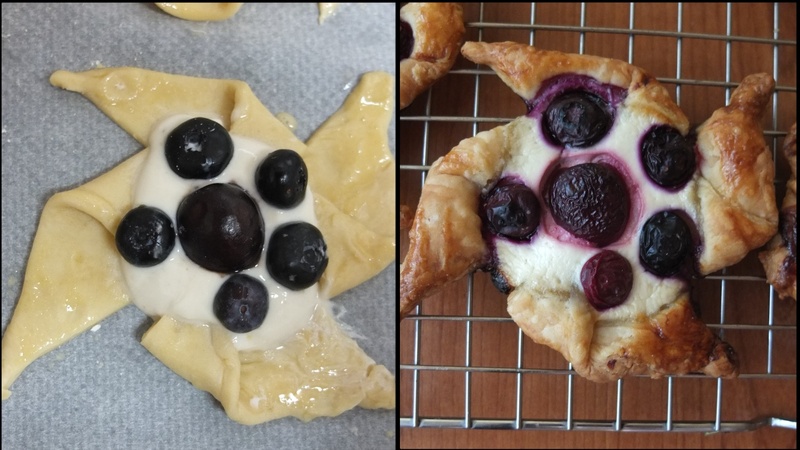 preheat the oven to 200°C/400°F (static, non-convection oven) or 180°C/350°F (fan-assisted) – or if it’s already hot in your kitchen wait until you’ve finished shaping the pastries and then preheat!!! Beat the Quark or cream cheese with the maple syrup or icing sugar and vanilla extract in a medium-sized bowl and store in fridge till needed. On lightly floured greaseproof baking paper, roll the pastry out till it’s about 2mm thick and a rectangle as even as possible (about 20cm x 30cm/8in x 12in). With a big sharp knife cut into 6 reasonably even squares (10cm x 10cm/4in x 4in). If the squares are actually a bit rectangular don’t worry, just stretch slightly to make them more square-like. 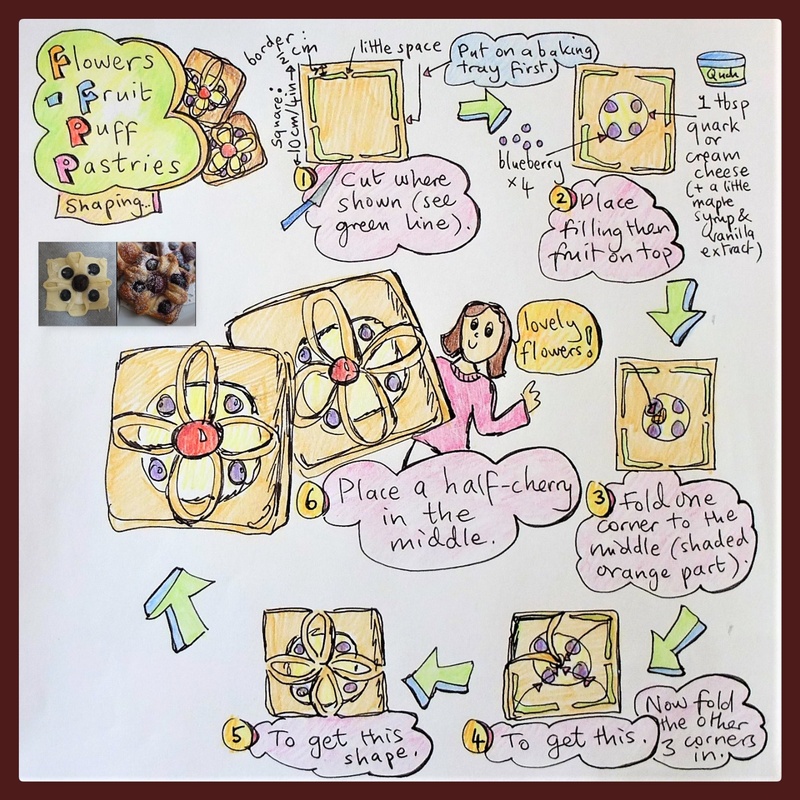 Carefully place a square on your baking tray (lined with baking paper) in it’s ‘baking position’ (you can place it there after it’s shaped as in the video but before can help if your pastry’s a bit soft and fragile). 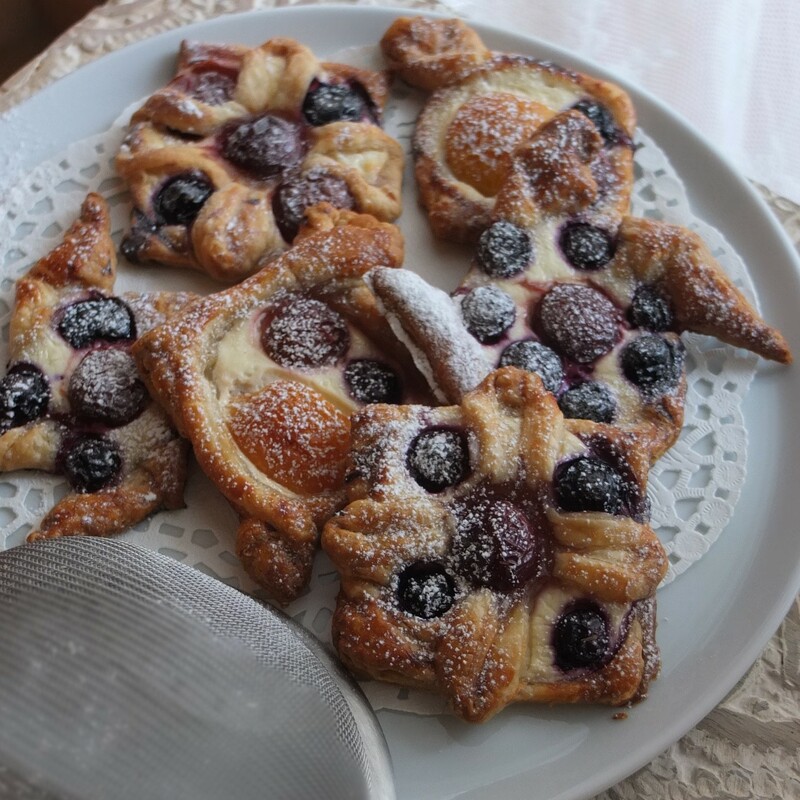 Shape your pastries. 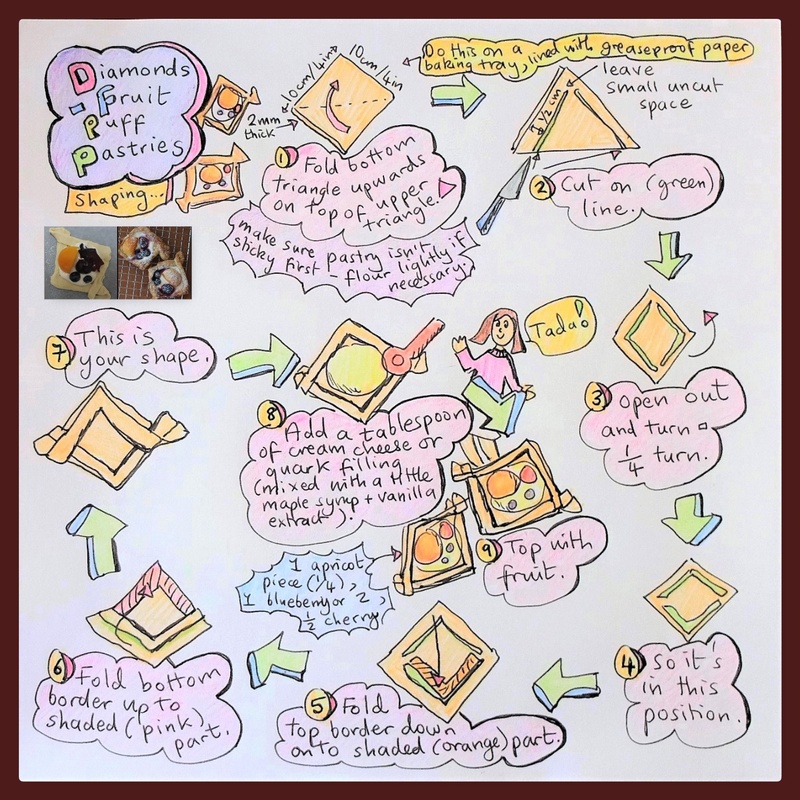 You can watch the Tasty video first then check with my little drawings to save pausing or replaying the video. Next I brushed mine lightly with beaten egg because they bake nicely this way. Bake in the middle of the oven till lightly browned (don’t open the oven for the first 20 minutes). I prefer them a little browner and crisper than they are in the video. Check they’re lightly browned underneath too. The pinwheels and diamonds take about 25 to 30 minutes and the flowers around 40 minutes. Take them out separately when you see they’re done. Best eaten on the day when the pastry is crisp. 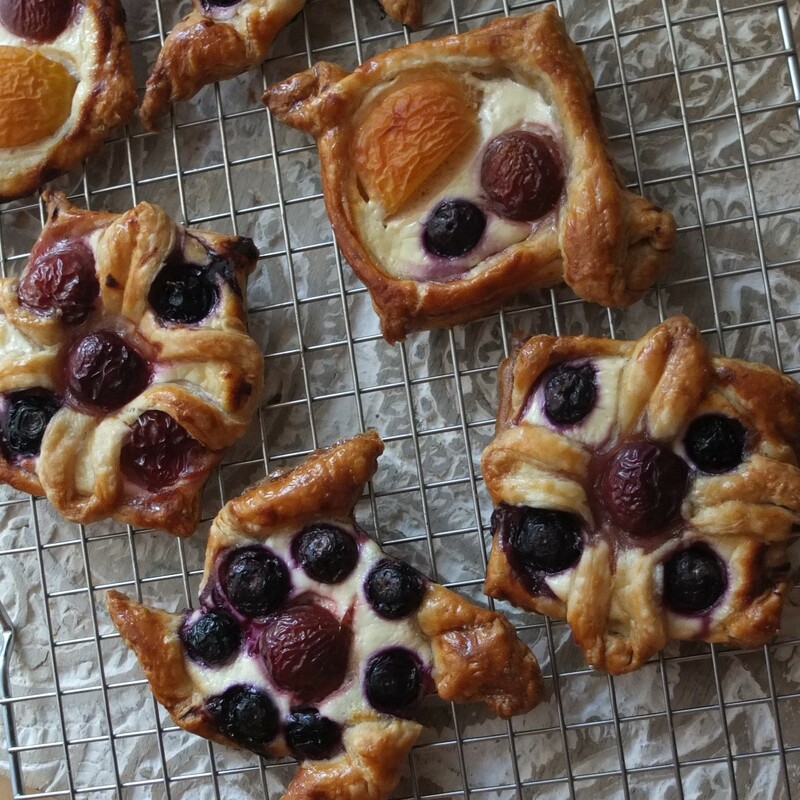 But stored in the fridge in airtight tupperware these pastries are still delicious softer the next day. You could also freeze some unbaked ones to bake another day. Before leaving you just wanted to share some photos of one of my very favourite places. Have been going there for years, originally to rock climb and it’s now become a yearly trip for me and mum. It’s beautifully mountaineous, rugged, friendly and you eat really well. 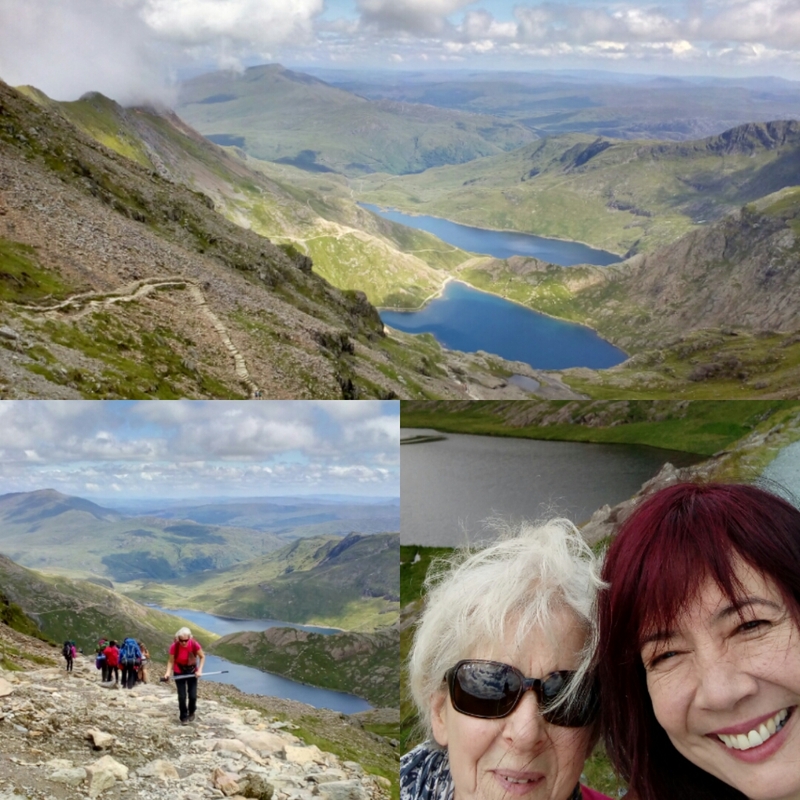 If you love mountains you’ll love Northern Wales and a walk up Snowdon’s miner’s path, where we did suffer a little! 🙂 That’s my mum there. 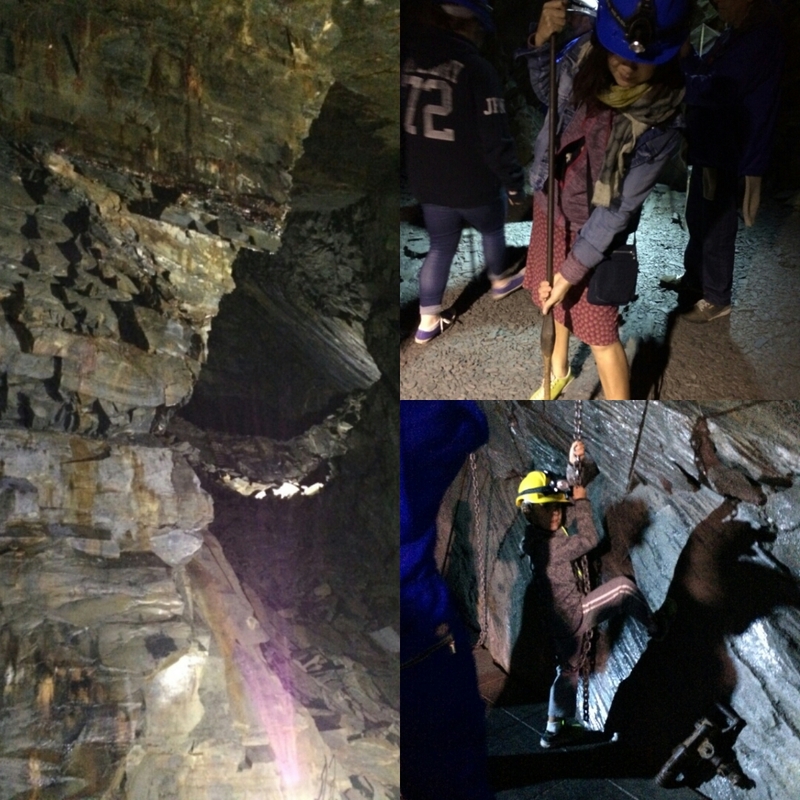 Then we had an amazing and very moving Deep Mine visit to the slate caverns in the historic mining village Blanau Ffestiniogg. They recount the incredible hardship and comraderie amongst the men and boys who worked the mines from the age of 8. During its boom days following the 1850s the mines rooved the world but life expectancy among the miners was around 37 years old with deaths caused by the lung disease silicosis and detonations. Originally the miners couldn’t even appreciate the beauty of the slate caverns as after a few minutes of expensive candlelight they worked in complete darkness, wrapping a chain around one leg as they handrilled up the side of caverns. On our visit there were photo opportunities to feel the weight of the hand drill and the chains. And if you’re a fan of steam trains you can happily travel around Wales in one. Hey, can you pronounce the words on the sign? 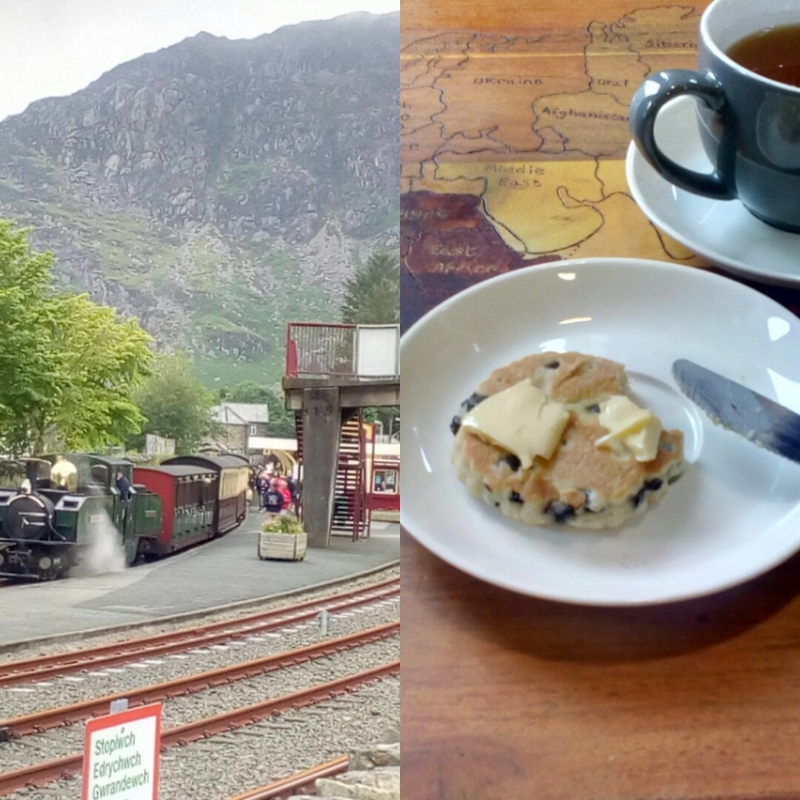 In Ffestiniogg around 80% of the population are Welsh speakers. And of course, could not leave out a photo of the incredibly delicious traditional Welsh cake we found in Blaenau Ffestiniogg’s Tourist Information café. Would quite like to make some… Anyone got any tips or a trusty recipe? We’re planning to go back to Northern Wales next year, naturally. Anyway, back to these fruit puff pastries. They’re lovely. I made some with good-quality shop bought puff and they were great too. So if you have some fruit hanging around waiting to be useful (pick me! pick me! ), there you go. 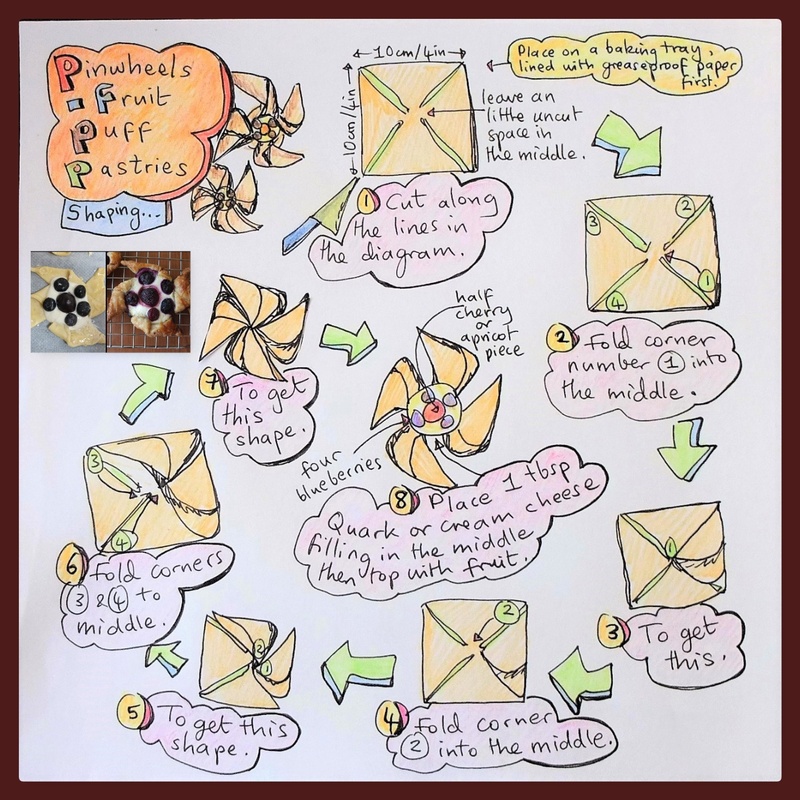 Make these fruit puff pastries. Want to try one? They look delicious. I almost made a dessert with puff pastry today but, instead I made a smores pie that caught on fire in my oven! Lol! Wish I took. A pic of the charred marshmallows. I like your pix of Wales too. Beautiful puff pastry! Find those illustrations very useful! These look amazing! I love puff pastries they are my go to treat! Thanks for an awesome recipe!